Plan d’Aguille for Some, Plaine Joux for Others « Alptitude! The wind was calm on the Midi, so the decision was to try to fly the Plan d’Aguille later this afternoon. 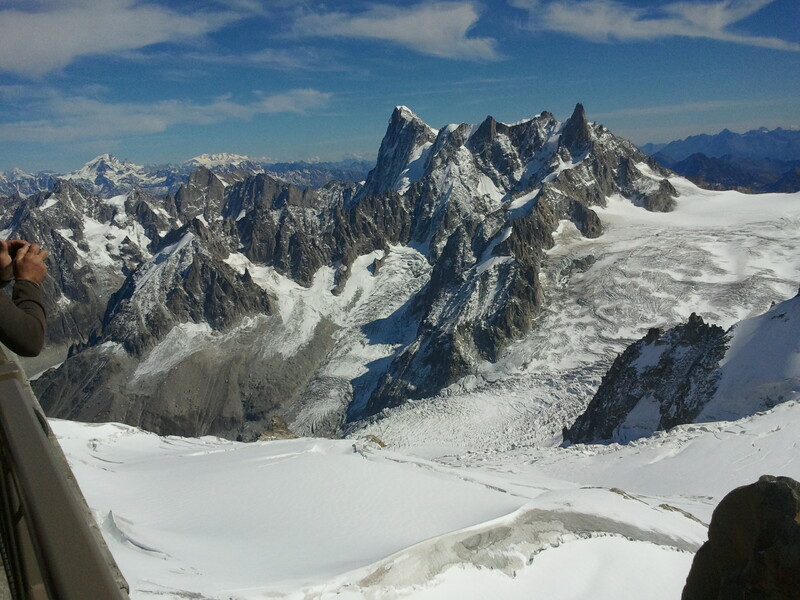 Dennis and Rozi went up to the Aguille du Midi first, as Rozi had never seen snow, coming from the Southern Hemisphere. I, meanwhile stayed here… believing it was actually going to be better flying here at home than the Plan today. As it turned out by the time they’d got down to the Plan, there was not much to hold them aloft so they had landed after a somewhat short flight.. Taking off from the Aguille du Midi, without crampons, a stout heart and protection rope would have been a fools errand, an error that would only have been made once, if you got it wrong! Apparently it was precarious to say the least. Anyway, I was on my way up to Plaine Joux, and was rewarded with a lovely afternoon evening extended flight accompanied by friendly waving Ben again… we circled around and about, took some good glides, some close scratches and landed at more or less the same time. Dominic Guenard was having a great flight, before going off to St. Hilaire tomorrow. Dennis and Rozi arrived at Chedde to pick me up. As soon as I’d landed, without further ado I was whisked into the bus and driven back up to launch so Rozi could have his last flight, as he leaves tomorrow, and I could drive the other vehicle back down. All in all, it’s been a nice few days.